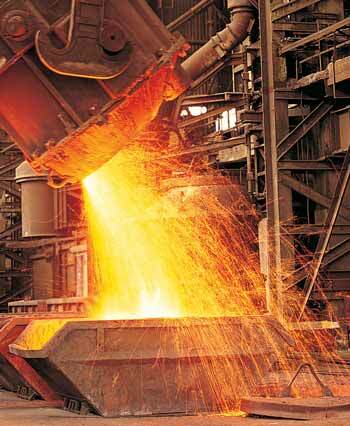 Moisture is omnipresent in steel mills. It comes primarily from mill cooling water entering the circulating oil system and from simple condensation during mill downtime. Although necessary to reduce the extreme heat generated in the processing of steel, water is among the most destructive contaminants to the circulating oil system. Water can degrade a lubricant in a variety of ways, including dissolution of the water into the oil, the formation of emulsions or simply the presence of free water. First and foremost, rust occurs when water attacks steel or metal surfaces, and this leads to the formation of iron oxide. Corrosion differs from rust because it occurs when metal surfaces are attacked by acids. Regardless, whether by rust or corrosion or both, the end result is the same: damage to the metal surface. In addition, rust and corrosion prematurely degrade the lubricant performance unless steps are taken to minimize the conditions that promote them and a quality lubricant is selected to ensure long life. All kinds of critical mechanical parts in the steel mill are susceptible to water contamination. These parts include roll necks, journals and roller bearings. Therefore, it is important to use lubricants that can effectively handle wet environments and resist quick degradation of quality due to the formation of emulsions, accelerated oxidation and other factors. The rolls in the hot-strip mill may be subjected to thousands of gallons of water every minute, so the bearings can take in significant amounts of water constantly. The churning of the oil and water through the bearings can create a milky-looking substance called an emulsion. An emulsion is a mixture of insoluble liquids in which one is dispersed in droplets throughout the other. In mill operations, once an emulsion forms, it is often difficult to break. Emulsion forming in the lubricating system will cause the circulating oil to lose its ability to lubricate effectively, which can result in rusting, oxidation, corrosion and a general degradation of the bearing life. Four key elements are necessary to form an emulsion: oil, water, agitation and an emulsifying agent. Agitation is necessary to shear the water into small enough droplets that could get dispersed into the oil phase. The emulsifying agent is a component that serves to stabilize the emulsion, and is usually present in small concentrations. It is soluble in the oil phase and it concentrates itself at the oil-water interface, forming a barrier preventing the water drops from uniting and subsequently breaking the emulsion. There are many materials that could act as emulsifying agents. Some examples of emulsifying agents include asphaltines (high molecular weight chemicals containing metals, sulfur, nitrogen and/or oxygen), phenols (and other cyclic alcohols), resins, and corrosion and contamination products such as silt, clays, sulfides and calcium by-products. The ultimate result of severe or prolonged water contamination of steel mill lubricants is excessive wear and early failure of various metal parts, especially the critical bearings necessary to keep production moving. There is much that the maintenance department in a steel mill can do to reduce the extent of water contamination, but because the presence of water is unavoidable, an effective lubricant must be able to show resiliency to excessive water. In other words, the oil must have good demulsibility properties. Demulsibility is a property of an oil to separate from water and resist the formation of emulsions. Ability of an oil to resist the formation of emulsions in service is the best measure of demulsibility rather than initial resistance to water. The oil will perform best if the water content is consistently kept below 0.5 percent. Factors that determine the demulsibility of an oil include the base stocks and additives used in manufacture, along with the presence of contaminants. Among these factors, though, the additives used to formulate a particular oil can have a great affect on how well the lubricant ultimately performs in a wet environment. Demulsibility additives (known as demulsifiers) within a lubricating oil act to break emulsions and promote water separation in two main ways. First, demulsifiers promote the formation of water droplets into a greater mass (as in a suspension) by creating a chemical bridge between the water droplets. The next part of the process of demulsification is coalescence of the water droplets. When the chemical bridge has been formed, the demulsibility additive acts to break the emulsion film and replace the emulsified water molecules to form an unstable film. The demulsifiers may also penetrate the emulsion to form a path through which water drains from one droplet to the other. This mechanism will allow the smaller water droplets to coalesce into bigger droplets and migrate to the bottom of an oil tank, where they may be drained off. Considering the potentially devastating effects of water, a lubricant that separates out water quickly and efficiently must be chosen. Complementing lubricants that promote good demulsibility, rust-inhibited oils counteract the potential rusting of roll necks, journals and roller bearings mainly through the action of specially formulated additives. Oxidation inhibitors block the formation of corrosive acids. In addition, OI are used to prevent oil thickening and the formation of varnish and sludge due to the oxidation of the oil. OI terminate oil oxidation reactions by forming inactive soluble compounds or by taking up oxygen. Organic compounds containing sulfur, phosphorus and nitrogen are commonly used as OI. Rust inhibitors are polar materials and retard rusting by having a stronger affinity than water for metal surfaces. Polar additives are attracted to a metal surface in a manner that iron fillings are attracted to a magnet. Sulfonates, amines, fatty oils and acids, phosphates and oxidized wax acids are among the chemicals used as RI. The oil film formed by RI oils assists in the repulsion of water. Demulsifiers (as discussed previously) act as water repellants and barriers to water entry (into the lubricant/circulating oil system). Copper (metal) passivators employ chemical treatment to make the surface of metals less reactive or inactive to chemical attacks. These compounds passify, prevent or counteract catalytic effect of metals on oxidation. Typical passivators are organic nitrogen- and sulfur-containing compounds such as certain amines and sulfides. Emulsifiers promote the emulsification of the free water. Specifically, these are surface-active agents that reduce interfacial tensions so oil can be finely dispersed in water. Examples include soaps of fats and fatty acids, sulfonic acids and naphthenic acids. R&O oils are necessary for use in circulating oil systems. Besides the necessity to lubricate roll necks, journals and roller bearings, effective R&O oils also act to lubricate other equipment such as drain pipes, bearing housings and reservoir ceilings. Many major steel equipment manufacturers (Morgan Construction, Danieli) and bearing manufacturers (SKF, FAG) have established specifications and guidelines for lubricant selection and performance. The standard MORGOIL specification (for a new oil) by Morgan Construction is an example of this. In recent years, many specifications have been refined to differentiate lubricants, particularly regarding their abilities to separate out water quickly and efficiently under various conditions. In the 1990s, Morgan Construction Company spearheaded an industry-wide initiative for improved lubricant performance in rolling mill bearings. The idea behind the MORGOIL advanced lubricant standard was to establish new specifications for oils that would shed water at normal operating tank temperatures (for example, 125 to 130°F) and retain the ability to shed water in service. This new specification allows for the identification of better lubricants for steel mill applications that are particularly prone to high water ingress. To differentiate the more stringent requirements of this specification from the previous standard MORGOIL requirements, lubricants meeting the criteria established by the Advanced Lubricant Specification were dubbed "super demulsibility" oils. The term super demulsibility describes lubricants that efficiently separate from water at normal operating temperatures upon return from the bearings (typically 125 to 130°F). In other words, these kinds of lubricants have outstanding demulsibility characteristics. Shell Morlina Oils are an example of an oil meeting the standard MORGOIL specification. Shell Morlina SD (or super demulsibility) oils meet the criteria established by the MORGOIL Advanced Lubricant New Oil Specification. Shell Morlina T oils are used in higher-speed mill roller bearings, especially in mills that produce long bars and rods that should not undergo any twisting in the finishing process. These are all heavy-viscosity products, measuring 100 centistokes or greater. Although the presence of water in steel mill operations is both essential and unavoidable, there are many things the operator can do to minimize its effect on the performance of the lubricants. Perhaps the simplest means is allowing the free water to settle out of the containment tank that holds the circulating oil. The free water may then be drained out of the bottom of the tank. Heating the tank will certainly accelerate the settling out of water, but the operator must be careful not to overheat the oil, which could induce premature oxidation. If the plant logistics allow it, a two-tank system may be used to get the most life out of the lubricants. When one oil tank becomes too saturated with water, the operator switches over to the other oil tank and drains the water from the initial tank. The process is repeated as needed. Plant maintenance personnel may benefit from the use of drop legs along the oil return lines to the tanks. As the tanks supply circulating oil to the bearings in the mill and receive the used lubricant back through return lines, many return lines contain sections of pipe protruding from them called drop legs. These drop legs accumulate water and oil as the water ingresses (enters) at each roll bearing and can be viewed to assess the condition of the lubricant. As a rule of thumb, the maintenance department will not typically allow more than two percent water in the lubrication system at any time. It is common to use a simple instrument such as the HydroScout test kit to quickly determine water content at a sampling point (drop leg). The HydroScout is a portable field test that quantifies water concentration in oil in a variety of ranges and produces instantaneous results of water content in the oil. Data generated from the HydroScout, tank temperatures, tank levels, system pressures and other parameters may be recorded several times each week to ensure that the systems are running efficiently and that the oil is performing as expected. Methods such as these allow for instantaneous estimation of the state of the lubricant and allow the operator to make recommendations on switching tanks or increasing tank temperatures immediately. Processes such as centrifugation and the application of a vacuum dehydrator are also useful to remove water from oil. Though centrifuging the oil allows for more rapid separation of water than settling alone, it will not remove dissolved water in oil. Vacuum dehydrators take this a bit further by combining a moderate heating of the oil and a large mass transfer area lower in atmospheric pressure, which acts to essentially boil off the dissolved water. Vacuum dehydration also does not remove nonvolatile additives from the oil. The mill maintenance personnel and roll shop operators can also work together to regularly inspect the chocks and seals. Chocks are the mechanical housing that holds the bearings in place and allows for sealing at the end of each roll (where lubricant comes in and most water washes out). Regular inspections identify problematic roll chocks and determine if the corresponding seals need to be replaced. The chocks themselves may be identified as needing remilling (refinishing). The roll shop can use information from regular inspections to highlight those chocks that may need to be rebuilt to specification tolerances, as well as for signs of damage, such as surface cracks in the bearing and seal leakage. Prompt corrective action can then be taken to ensure continued operation, the minimization of leaks and the prevention of mechanical failures. Finally, the selection and use of quality R&O lubricants is important to ensure smooth operation and protection of critical metal moving parts in a steel mill. Choosing well-formulated lubricants supplied by reputable oil companies should allow for excellent operation of bearings and other important moving parts. Gregory Sedelmeier is the project leader of circulating and bearing oils for Shell Global Solutions Inc. He has more than 18 years experience in industrial oil and grease development. For more information, visit www.shell.com. J. Wu, Y. Xu, T. Dabros, and H. Hamza. "Effect of Demulsifier Properties on Destabilization of Water-in-Oil Emulsion." Energy Fuels, 17 (6), 2003, p. 1554-1559. Alan Eachus. "The Trouble with Water." Tribology and Lubrication Technology, Vol. 61, October 2005, p. 32-38. L. G. Ludwig. "Properties of Enclosed Gear Drive Lubricants." Machinery Lubrication magazine, May-June 2004. M. Duncanson. "Detecting and Controlling Water in Oil." Practicing Oil Analysis magazine, September 2005. Edelweiss Enterprises Inc. "Emulsions." article from www.echemical.net. G. Basilone, T. Wojtkowski, and L. Silva. "Dynamic Testing of Super Demulsibility Lubricants." Iron and Steel Exposition and AISE Annual Convention, Cleveland, Ohio, September 1999. The Lubrication Engineers Manual. Association for Iron and Steel Engineers.